Gram-negative bacteria (GNB) resistance is especially concerning due to their rapid spread and limited treatment options, carbapenamase, such as Imipenem and meropenem were often considered as the last resort treatment for nosocomial infections caused by multi-resistant Gram-negative organisms. Hence, resistance to carbapenems in enterobacteriacae are of great concern. Production of carbapenemases, which hydrolyze not only carbapenems but also all other beta lactam antibiotics, is mostly responsible for the resistance to carbapenamases. The most five common carbapenemases include imipenemase (IMP) type, veronica integronmetallo beta lactamases (VIM) type, Klebsiella pneumonia carbapenemase(KPC) type, New Delhi metallo beta lactamases-1 (NDM-1) and also oxacillinase 48 (OXA 48) which is the most common enzyme in Turkey, Carbapenem-resistant enterobacteriacae (CRE) is usually resistant to all β-lactam agents as well as most other classes of antimicrobial agents such as fluoroquinolones, aminoglycosides, and co-trimoxazole, Infections caused by CRE have high mortality rates due to very limited available treatment options. High dose carbapenem, polymixin B, colistin, tigecycline, fosfomycin or aminoglyside can be called as preferable CRE treatment options. The treatment of serious CRE infections should base on Minimal Inhibitor Concentration (MIC), Colistin, tigecycline and fosfomycin are used as primary treatment options. KPC-producing K. pneumoniae treatment algorithms depend on the site of infection. Colistin is the first option especially in blood, lungs and gastrointestinal tract infections and also preferred for urinary tract infections as a possible therapeutic agent. Tigecycline is the first option in the gastrointestinal tract infections and potential therapeutic agents for the blood and lung infections. Fosfomycin, while a first option for urinary tract infections, is among the agents that may be preferred for other sites of infection. MIC levels of antibiotics are important to adjust the dose for treatment. In the 1970s, the CLSI published the breakpoints of susceptibility for Colistin and polymyxin B. However, at that time the procedures for standardization of susceptibility testing, the establishment of interpretative breakpoints and the definition of quality control strain guidelines were less rigorous. Disk diffusion is not reliable for polymyxin susceptibility testing. 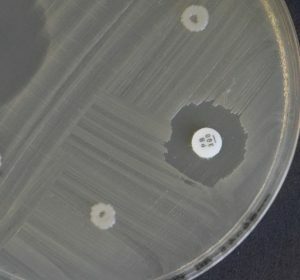 The small zone of inhibition and significant assay variability are attributed to poor diffusion of polymyxins into the agar medium. Recently, polymyxin disk diffusion testing has been removed from the CLSI guidelines. EUCAST guidelines have never recommended disk diffusion testing for colistin.